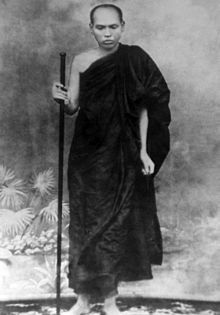 Today is the birthday (1846) of Ledi Sayadaw U Ñaṇadhaja (လယ်တီဆရာတော် ဦးဉာဏဓဇ), usually called simply Ledi Sayadaw, one of the foremost Burmese Buddhist figures of his age. He was instrumental in reviving the traditional practice of Vipassana, making it more available for renunciates and lay people alike. Many of his works are still available, including in English through the Buddhist Publication Society. Ledi Sayadaw began his studies at age 20 in Mandalay at Thanjaun. While there he was considered to be a bright and ambitious young monk but his work was scholarly and there is no evidence that he engaged in any serious meditation practice during his years in Mandalay. After a great fire in 1883 caused the loss of his home and his written work up to that time, he left Mandalay and returned to the village of his youth. Soon, Ledi Sayadaw founded a forest monastery in the Ledi forest and began practicing and teaching intensive meditation. It was from this monastery that he took his name, Ledi Sayadaw, meaning “respected teacher of the Ledi forest.” In 1885, Ledi Sayadaw wrote the Nwa-myitta-sa (နွားမေတ္တာစာ), a poetic prose letter that argued that Burmese Buddhists should not kill cattle and eat beef, since Burmese farmers depended on them as beasts of burden to maintain their livelihoods, that the marketing of beef for human consumption threatened the extinction of buffalo and cattle, and that the practice was ecologically unsound. He subsequently led successful beef boycotts during the colonial era, despite the presence of beef eating among locals, and influenced a generation of Burmese nationalists in adopting this stance. In 1900, Ledi Sayadaw gave up control of the monastery and pursued more focused meditation in the mountain caves near the banks of the Chindwin River. At other times he traveled throughout Burma. Because of his knowledge of pariyatti (theory), he was able to write a number of books on Dhamma in both Pali and Burmese languages such as, Paramattha-dipani (Manual of Ultimate Truth), Nirutta-dipani, a book on Pali grammar and The Manuals of Dhamma. At the same time he kept alive the pure tradition of patipatti (practice) by teaching the technique of Vipassana to a few people. 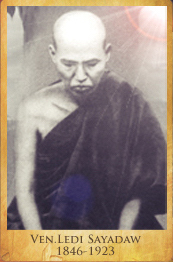 Among Ledi’s disciples, Theik-cha-daung Sayadaw(1871-1931) and Mohnyin Sayadaw(1872-1964) are well-known. 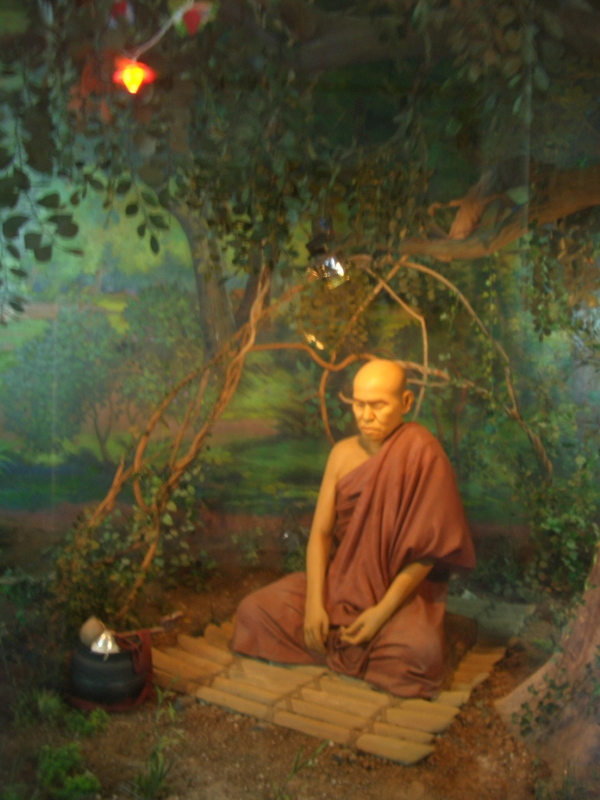 Theik-cha-daung Sayadaw taught an illiterate farmer and layman Saya Thet Gyi, who went on to receive training from Ledi himself. Thetgyi’s lineage continues to the present, the most prominent being U Wunnathiri and U Ba Khin and his disciples, others include S.N. Goenka. 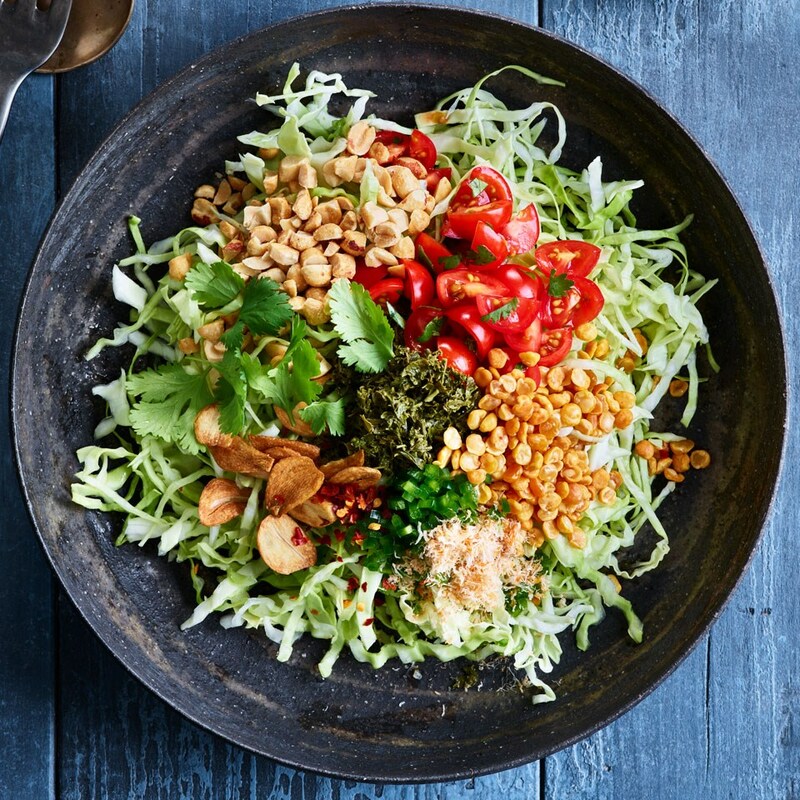 Burmese fermented tea leaf salad, or lahpet thoke, is extremely popular in Myanmar. You can get lahpet in any number of places, and when I lived in Mandalay, friends in other countries often asked me to send some to them. I frequently had lahpet rice for breakfast. There is an old Burmese saying: “Of all the fruits, mango is the best; of all the meats, pork is the best; of all the leaves, laphet is the best.” Lahpet has a very long history in Myanmar. In ancient times, fermented tea leaves were used as a peace symbol or as a peace offering between kingdoms at war. Now, a lahpet tray is the traditional expression of hospitality offered to house guests. 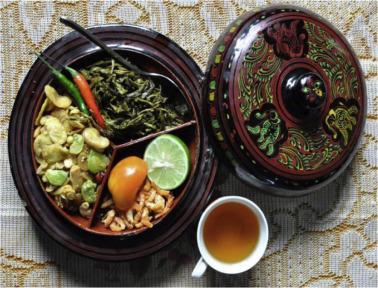 A typical lahpet thoke consists of fried legumes such as broad beans or yellow split peas, toasted sesame seeds, fried garlic, roasted peanuts, dried shrimp, chili, sliced tomatoes, shredded cabbage and oil, along with the fermented tea leaves. You can then add fresh lime juice. When served as a snack on a tray, pickled tea leaf is called ahlu laphet (ahlu means “donation ceremony”), and all the ingredients are served separately. This presentation is traditionally served after a meal, at ceremonies such as engagements, weddings, and funeral ceremonies. Lahpet is so important to Burmese culture that when tea leaves are harvested, the best of the crop is set aside for fermenting and eating, while the rest is dried and processed for tea and drinking. The freshly harvested tea leaves are briefly steamed, then packed into bamboo vats and set in pits, pressed by heavy weights to encourage fermentation.